BIC| "A story told, a lesson learned, these words in memory are now burned." How very amusing that she would dub a wind sprite a pixie, for to be so readily close to striking true is indeed a feat worth noting. "'A thousand words lay behind your every thought.' I remember when Songhue first said that to me... I didn't understand it then, though I do now." "The time has come to pay in words and so shall we now each share of our own, dear Flutter, if you would but listen." Sign snorted lightly here, stretching and prancing in place, her coat rippling like so much water. The energy in the glade was building, giving her a new gleam to those soft purple eyes. "I am of no time," Songhue began, her voice growing quiet with an aged pain as Sign shifted excitedly. "I hold such things as should be set free for they are each a part of mine own self. What has passed I live still, for I walk that era freely. What has yet to come is known to my eyes. The seas of time do not flow as a river, yet lay in all direction, barely glimpsed though they be to we who are outside of it." She wove. Songhue couldn't seem to help herself, in all honesty. She sat and spoke and wove, the small pixie gown growing into a garment for a small woman, the air humming with her magics. It seemed that while she spoke, this was all that was known to her. "What has been is dark indeed, for I know every face that was lost to me. I walk the realm of ghosts and tears, keeping to feel of a hand, the sound of a laugh alive within me. They would be free, would fade into Mother Memory, yet I walk the lands of what once was. I see how they once lived, learn of what had been before I had even born. And there is naught for this fact, as I live in what has passed, what is now, and what is yet to come. I know what whisper's through the heart of my golden friend, know what lays in wait for my dark hued lovely, feel the earth from where this lady of the sea once called home." Sign slowly calmed, ears pricked forward, eyes mildly glazed. 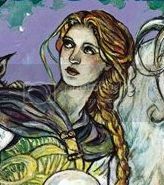 She could see these things as well as her bonded spoke, could see the land that was lost to the fae, could see the changes that lay in wait for Sparkle and the thoughts that plagued Path. She even saw a great sea of sifting golden hues, a sea that parted around a small figure as it stretched endlessly in all directions; up, down, left, right, behind and in front. For a moment, she even saw a pale, glimmering thread reaching from her chest to that of the fae's. And then the visions faded, leaving her blinking beside the stream, tossing her main in a mild state of agitation. She couldn't help but wonder if she would ever grow used to the whispering thoughts the fae sent through her mind, much less being pulled into the images whenever she opened her mind. "I live in my homeland still, in a sense of such things. I see it as it was.. And I see it as it is now, can feel the soul of the lands healing still. I hold these things, yes; yet they ever grip me." "So when you said.. When you said that behind every thought there hides a thousand words.. You meant the memories behind it." "I did. And again, I did not. Think of when I told you this." "I had only just been placed in your care. I was scared, confused.. Lonely. A tangled mess of a knot, as you put it." Songhue nodded, encouraging her to go on, yet Sign paused all the same. She had been a knot, there was no denying such a thing. And the best way to untie a knot? Trace the path back to unwind what had twisted. "It was the first time you set aside an entire day for me, come to think of it. You didn't speak very much, nor did I, yet we walked and listened all the same. I didn't realize until that night how hard it had been for you to do such a thing..."
She snorted, tossing her main and pawing the ground at the memory. It had been a rather nasty shock. "I saw you, as you went to rest in your bed of moss. Your legs were bruised, shaking in spasms; your feet had swollen. It was then that I decided that, for all you do, there had to be someone to do the same." OOC| Are too. You proved yourself wrong in the words following. Flutter was grave. There was a long silence before she responded, for Songhue’s words had left her enchanted. Indeed she could understand the hauntedness now. "She does, in truth. No matter what secrets she holds, she is ever here, ever aware of what's needed of her now. Songhue lives her life with no indication that there is more than is seen." "I believe you misunderstood what she asked, my dear. She wishes to know if I could wander in such ways without knowing these pains. And in truth, as dull and aged as this ache is, it is none too much to consider." "In any case, you don't dwell on it or let it stop you now. What I saw that night is proof." "What you saw that night was a weak wind sprite climbing in bed after expending vast amounts of energy. There is nothing special in such a thing." Sign merely shook her head, snorting lightly as she trotted over to nudge Flutter in a companionable manner. In all honesty, she was rather surprised that her bonded wasn't raising objections to the thought of someone looking after her; Epona knew the fae made it hard enough on a daily basis. "Don't worry so, Flutter. There's never any reason to fear with Songhue, and I'm honestly glad to have someone help me in the matter for once." She smiled, offering a tender nuzzle here as she pranced about. The winds had shifted, moved with a different tone, and so her bonded had settled. "I know of a tale, Sign, that would certainly tickle you, and perhaps yon Flutter as well. 'Tis of the seas and sun and shadows. Yet ye must promise to offer a lesson in your own right, for such is demanded upon this day." "I promise, M'Lady, would I but hear your words." "'Twas the week before I was to have my coming of age ceremony, though I did not know such a thing then. I had taken a cousin to the waters that danced with the moons, the great sea of many beasts. Of course, taking the one meant that everyone else had to tag along." She smiled, eyes warm as the gown filled out, the winds displaying the midievil undertone to the garment. Hardly a shadow could be seen in her face now, yet shadow was there still. "KittenKat, the cub of my sister-cousin, was tickling the seaweed. Kyle, ever the little sparkfire, decided it would be more fun to tickle her and make her fall in the water. Of course he got tangled up in the process and instead of asking politely for the plants to release him he tried his best to rip them apart." Sign snorted, knowing full well the temperment of the seas and the life that dwelled in them, her purple eyes flashing in amusement. "The other little ones ran over to see if they could help out. They weren't so disrespectful, so none else became tangled. They caused such a commotion, however, that one of the creatures in the seas picked up every last one and plopped them in a sand dune hard enough to bury them alive. And what should they say once I coaxed the sands away? 'Wheeee, I wanna do that again!'" She laughed, shaking her head at the memory, and leaned against the willow with a mumbled "Ahh meee... Cubs, eh?" "Which is something in and of itself, I think. Yet once they started back towards the water Kyle found that he couldn't play; the waves would roll him back to shore. Only him. He pouted for the rest of the day, but I must admit it was quite the sandcastle that came from it." "A story told, a lesson learned, these words in memory are now burned," Sign chortled. And she couldn't help but think it true; she would never see another crab getting tumbled to shore without thinking of how a certain cousin of her bonded had been tossed about that same way. Flutter nudged Sign back amiably, glad to be close to others again, even if she had no wish to be bonded or “bound” as she had come to think of it. “I am glad if I can help, Sign.” She felt at a loss for words to this Sign and hoped the other would not think her conceited. “When I was but half grown, there came a night when the wild ones of the forest gathered in a huge cave to tell stories and trade news. My friend Dagg was a daydreamer of sorts and happened to set out for the gathering late. He was caught in a mighty storm, with winds gusting and rains pouring from the sky.” Flutter could almost taste the cool rain-laden air wafting in through the cave entrance, hear the whipping of the wind outside, smell the firewood’s musky scent as it burned in the confined cavern. “When Dagg arrived he was soaked through and very cold. He made his way to the firepit but there were many other younglings warming themselves in front of the fire and he could not get near it. As he stood there shivering, an elder welcomed him and asked him why he was looking so sad. ‘I have lost my sack full of treasures,’ said Dagg.” Flutter remembered the tension this statement brought to the air as the competitive foals let their thoughts linger on a bag of unnamed treasures. “‘Where did you lose it?’ the elder asked my friend, as the younglings who had been standing in front of the fire flicked their greedy little ears at the conversation. ‘If I were you...’ began the elder. Last edited by Vineda on Sun Aug 31, 2008 10:07 am, edited 1 time in total. "Such trickery," Sign laughed with a merry swish of her tail. "A story told, a lesson learned, these words in memory are now burned," Songhue grinned. It was lovely indeed, to hear such a classic telling. "It makes me think of Wolfy, in all honesty," Sign grinned, and now there was a definite flame to those soft purple eyes. It was her turn for a tale, and for a moment Songhue felt herself being swept up by the rolling memories of her friends and loved ones; as was meant to happen on a day such as this. "She was always fiddling in that chem lab of hers and we were all certain that one day she'd do some kind of serious damage. It fell to me to help make sure she remembered to eat, in all honesty, such was her mind set." "Absent, apparently," Songhue grinned, her eyes glowing softly in memory of the old friend. The shadow remained, as it ever did, but the love and warmth were unmistakable all the same. "Yes, absent was her mind, or so it would seem at times! One would do well not to assume too much with her, however, as was found the day a cousin creeped into the place during one of the rare moments it was empty." She pranced happily here, the mere memory of her last bonded making her ready to catch something dropped, a fact that gave her great amusement. "The little one couldn't help but mimic Wolfy, and low and behold the mess she made! She tried to clean up and dashed out the door right as we entered; for nary was there a place I let the welven travel alone. I had expected her to be upset, yet she simply repaired any damage she found with a strange, fanged grin." Snorting, she tossed her main and winked at Songhue, hoping with all her heart that she would get a sincere laugh out of the quiet fae. "The next day she decided she would go for a walk. It wasn't all that uncommon, honestly, as one learned to expect strangeness while she was around. The cousin, of course, had gotten over her fear and returned to try her paw at whatever it was Wolfy had already denied her. We weren't gone for very long, yet apparently it was long enough that when we did return it was to find a rather amusing sight. Apparently Wolfy had fixed it so that the cub's hair would grow and become conscious enough to bind her to the nearest seat!" She arched her neck as her bonded laughed heartily, her own chuckles whispering from her chest. Such a lovely place she had known. "We had to cut it all off, in the end, and though the little one did weep she was rather glad to have her arms freed. Last I know of she still hasn't come within a hundred paces of that place." Flutter too was swept up in memories, and appreciated the laughsthey drew from the gathering. It was delightful to see the others so animated. When Sign finished her story, she laughed so hard her stomach hurt. "The poor little one! Imagine having all of your hairs turn against you! 'Twas an excellent way to teach such a lesson." She snorted and shook her head. "I am glad to be here swapping such amusing tales! They do the heart much good." "I have another if you should like to hear it..."
She chuckled quietly and slowly lowered her neck to the ground to swipe another bite of her mango.